We have enabled WooCommerce WordPress Plugin integration on Crunchify last week. It’s been fantastic week and we are working so hard to release full featured Shopping experience on Crunchify soon. 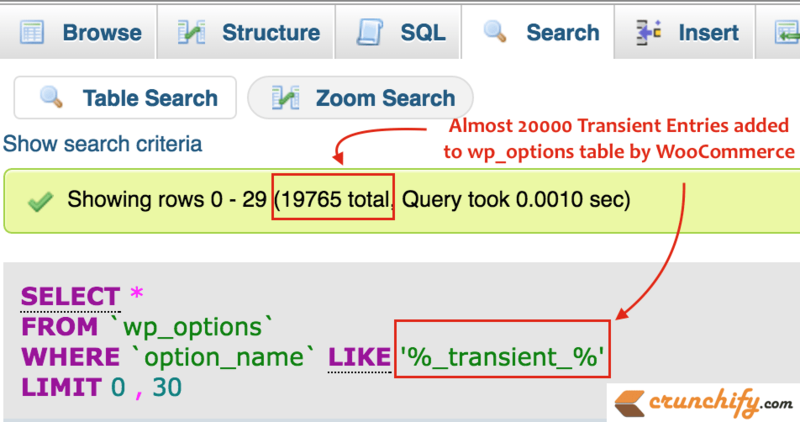 Today I was checking all database tables as part of routine activity and suddenly noticed large number of _transient_ records in WP_OPTIONS table. Almost ~20k entries?? Oh no.. that’s too much. I tried digging more into it and most of those entries were divided into below 6 transient keys, all related to WooCommerce. Only last two entries have unique IPs and those are dynamic based on user’s IP addresses. By looking at this first, only thing I thought – who is adding these entries to wp_options table? Must be from some plugin. After digging more and removing all other possibilities I finally end up checking WooCommerce plugin’s setting page and found an option related to Geo Location. Are there any disadvantages having those many _transient_ entries in DB? Yeah, more Database table entries cause higher search query load time, which eventually slow down your site. It’s against WordPress Speed Optimization Goal. Your site may get penalize in Google Search Result page because of page load time issue. How to fix and cleanup _transient_ records in WordPress wp_options table? As you see in above image, I’ve immediately disabled Default Customer Location setting to No location by default. Above operation will not break WordPress site if your delete all _transient_ records from wp_options table. WordPress will recreate all required _transient_ records again. Now you shouldn’t see any new entries added to wp_options table related to customer GeoIP location. Easy to read for Vietnamese like me. You are welcome Duc Phuli. Thank you so much! It was really, really useful for me. Good to hear that Max. Happy Blogging!